As calving season enters into full swing across Irish dairy farms, a large degree of uncertainty remains over the market outlook in Q1 and Q2. On the continent, Arla and FrieslandCampina have cut their farmgate milk price in February by 2c/kg and 1.75c/kg respectively. EU monthly flows are growing with a strong ending to 2017 recorded with output +3.8% in September, +4.4% in October and +6.1% in November. High milk prices and favourable weather conditions has stimulated output year on year across Europe with Germany, +6.4%; France, +5.4%; United Kingdom, +7.8%; Netherlands, +2.9%; and Italy, +5.3%. In the US, milk production increased to 94.8 billion litres in 2017, representing a +1.4% increase year on year. Meanwhile, Irish milk collections climbed to 7.2 billion litres in 2017, a cumulative increase of 9.2% year on year. 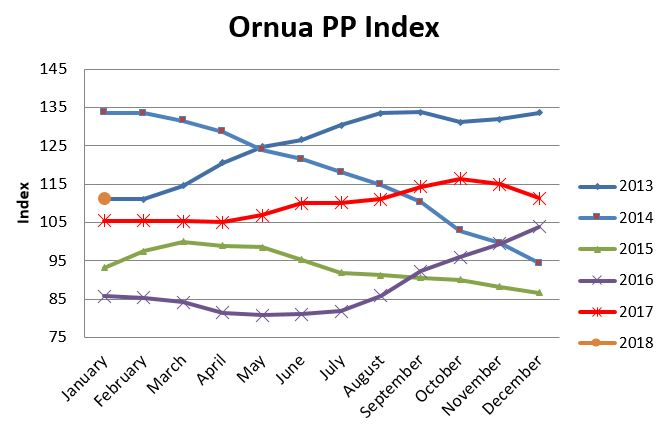 The Ornua Purchase Price Index for January is unchanged at 111.3. The strong recovery in EU production is offset to a degree by a decline in New Zealand’s output. The most recent GDT auction is up 5.9%, with milk flows in New Zealand -2.5% in December affected by drought. Furthermore, stronger oil prices in 2018 should benefit demand, particularly in the MENA region. Butter/SMP returns remain unfavourable versus alternatives, with SMP stocks particularly in Europe weighing heavily on the market. The EEX Index for butter is trading at €4237/tonne, an improvement on last month. The SMP Index is languishing at €1368/tonne. The recovery in EU milk collections is likely to result in extra cheese output with strong demand needed both domestically and in third country markets to maintain price stability.